LeBron can do a lot by himself, but he could use some help from his teammates. The Warriors’ brilliance on both ends of the floor in their first two wins over the Cleveland Cavaliers during these Finals can’t be denied. But this won’t be an article fawning over how big of a difference Kevin Durant has made, or how a healthy Stephen Curry has drastically changed the dynamic between these two teams. You can find that throughout the basketball and sports internet. What we’ll focus on here are three players on the Cavs — who, if you remember, are still a really good team — who need to start playing way better if Cleveland wants to change its fortunes at home on Wednesday night. After a brilliant Finals a year ago, where he averaged 19 points per game on 46.8 percent shooting and 40.5 percent from three, Irving hasn’t been able to keep up with Golden State thus far. ESPN’s Marc Stein quoted ESPN Stats & Info’s Micah Adams, saying that the pace (possessions per 48 minutes) over the first two Finals games are the two highest-paced games in LeBron James’ playoff career, spanning a whopping 214 games. 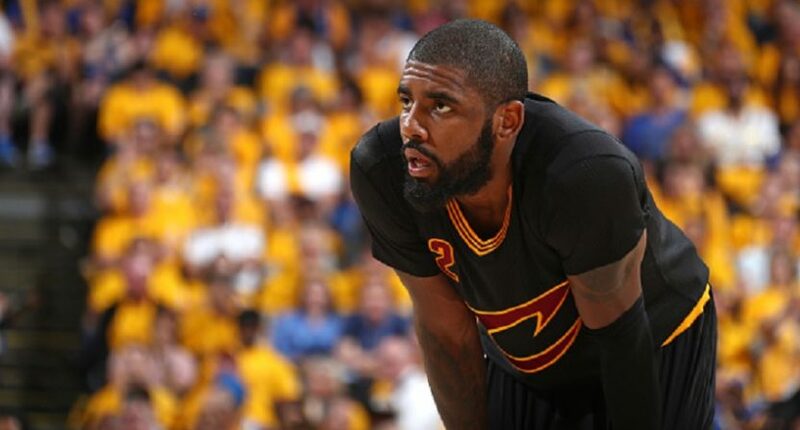 While LeBron is keeping up with the pace, Irving is definitely not in this series. Kyrie missed 27 of his first 45 field goal attempts, a vast majority of those coming from two. Irving’s problem so far is not shooting from distance— he’s hit five of his 10 3-point attempts and should probably be shooting more of them in the series— it’s finishing at the rim. According to NBA.com, the average field goal percentage for shots inside the restricted area is 57.4 percent. Irving is 11-for-24 (45.8 percent) from that area over the first two games. That wouldn’t cut it against any team, and certainly not against these Warriors. Even worse, Irving is not only not finishing at the rim, he isn’t getting to the line either, with a grand total of three free throw attempts. Keeping up with a healthy Curry defensively certainly hasn’t helped, and Irving isn’t a good enough defender to deal with that. But he should be able to keep up offensively. And with Deron Williams struggling to keep up as the point guard for the second unit, Cleveland will have zero shot without a vastly improved Kyrie Irving. When J.R. Smith plays in a basketball game, J.R. Smith is usually heard from, whether good, bad, ugly or ridiculous. In this series, J.R. has been eerily quiet, a non-factor and worse than non-existent because he’s taking potential minutes away from other players on this Cavs team that cannot afford empty minutes from anyone against the Warriors. Smith didn’t attempt many shots in Cleveland’s playoff run through the Eastern Conference, but he hit nearly 45 percent of his threes and played passable defense for the Cavs to get here. In 42 minutes so far in this series, Smith has hit one of his six shot attempts and scored a total of three points, with two rebounds and no assists. Cleveland has been outscored by 30 points when he’s been on the floor. Marc Berman of the New York Post made a good point by positing that the Cavs should start the more defensively inclined Iman Shumpert over Smith, especially since Smith hasn’t done anything offensively. Shumpert could more capably keep up with perimeter foes and the Cavs were only outscored by 12 in his 48:27 on the floor. Shump only hit three of his 12 shots from the field, but grabbed nine rebounds and had three steals. Perhaps Smith starts on Wednesday and is invigorated, pumped, and hyped, amped up by the home crowd and by the urgency of a 2-0 Finals hole for the second straight season. Or maybe parking him on the bench in favor of someone who can defend is the more prudent option with zero margin for error. 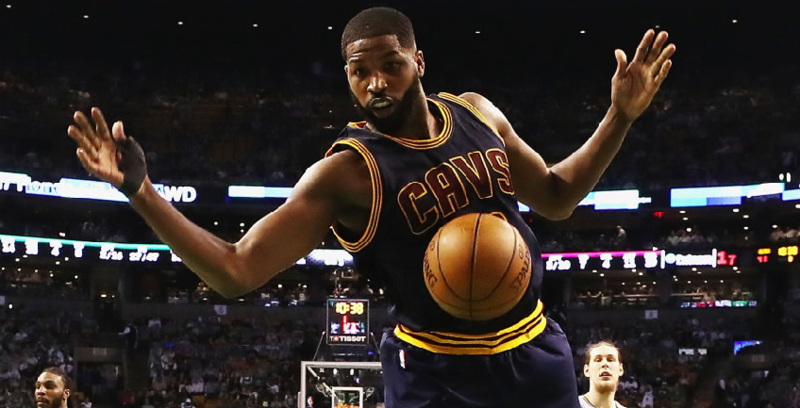 The energetic Thompson was a revelation for Cleveland in its comeback last season against Golden State, averaging a double-double, including a massive 3.9 offensive rebounds per game. So why has he struggled so mightily in this year’s Finals to date? Perhaps it’s the improvement in the Warriors’ big men from last season to this one. Golden State’s personnel went from Andrew Bogut, Harrison Barnes, Mo Speights and Festus Ezeli last year to Zaza Pachulia, Kevin Durant, JaVale McGee and David West this year. Whatever the reason, Thompson has a total of eight points (zero in Game 1) and eight rebounds so far in 43:39 on the floor. Maybe Thompson needs to bring more energy, or maybe he’s not equipped to deal with the blistering pace of these Finals. Maybe Golden State’s lineups are too lengthy, rangy and athletic for Thompson or any Cavalier not named LeBron James or Kevin Love. 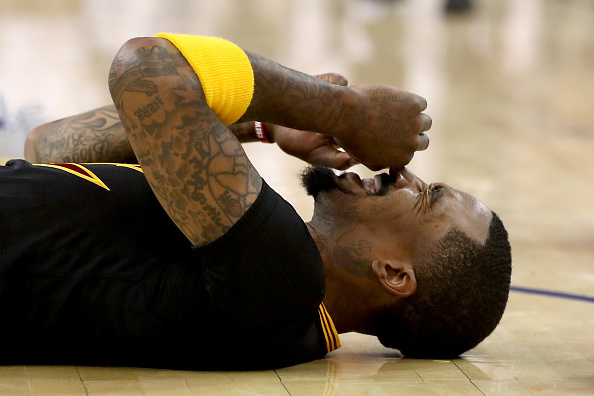 Maybe the Cleveland Cavaliers are doomed to be swept no matter how well they play. But if the Cavs want a fighting chance to get back in this series, or at least have it extend past Friday night’s Game 4, they need a whole lot more from Tristan Thompson, J.R. Smith and most importantly Kyrie Irving.